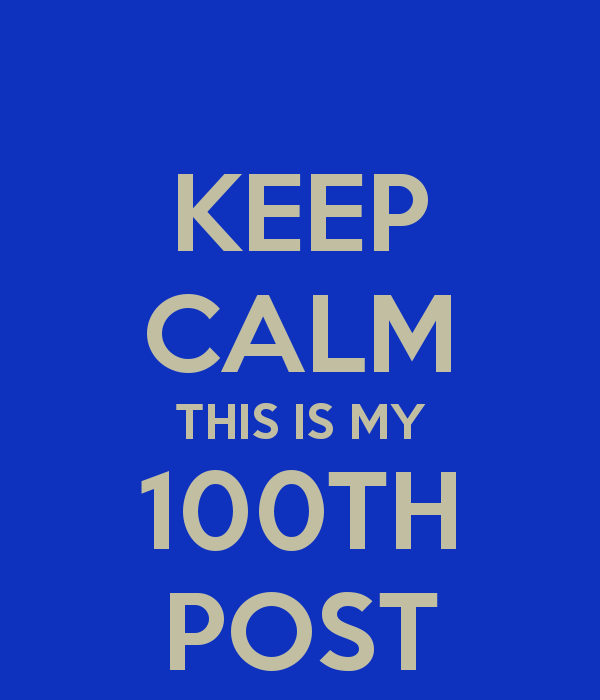 Another milestone – this is my 100th post. I have reached yet another milestone it seems. 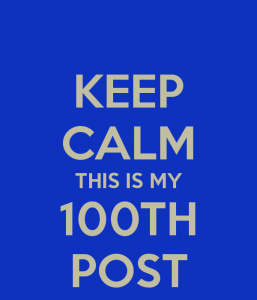 This is my 100th post on this blog, and I wouldn’t even have noticed if WordPress hadn’t reminded me. Wow… Who would have thought that I would have enough things to say for even 50 posts, yet alone 100? When I started this blog back in October 2013, I hadn’t even imagined that I would reach this number only a little over a year later. I have a confession to make. I have never been very good at creating this kind (or any kind) of content with any kind of consistency. I never even managed to keep a diary for longer than a month or two. I would try it from time to time, and the first few weeks I would write every day, then once every few days, then once a week maybe, until the diary got put in a drawer to be forgotten. Then I would unearth it two or three years later, dist it off and try keeping it again. And the whole circle would repeat itself. So I am the most surprised that one year later I am still here and I am still blogging, and that I manage to write two post a week as well. And not only that, but that I actually LIKE doing this! I discovered that I really enjoy blogging. I enjoy sharing my ideas, my opinions and my stories with my readers. Nobody likes to created in a vacuum. It’s like talking to yourself in an empty room. It might echo, but all you hear back is your own voice. When I started posting on this blog, a lot of times it felt exactly like that. I think the very first comment on one of my posts was from a spam bot and I had wanted to hug it then because hey, somebody had noticed me! Of course, my blog is a small fish in the ocean. I only have 150 followers right now and my site gets only a few dozens views per day, so for many of you it would be considered small potatoes. But for me, it’s everything. A writer craves feedback, whether on the novel she is working on, or the blog post she just published. Being able to get that feedback is what motivates us to soldier on even on the days when the ideas refuse to come and the words bleed into the page. So this post is mostly to say a big THANK YOU to all my readers. I probably wouldn’t still be here it wasn’t for you. Thank you for visiting my blog every week and taking precious time out of your day to read my ramblings about my writing ups and downs, as well as my book reviews. 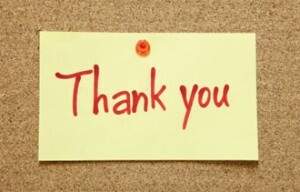 Thank you for liking my posts and commenting on them. Thank you for sharing them on social media. I truly feel blessed to have you! And now, onward towards the next milestone! Previous PostAtlanta Burns by Chuck Wendig.Next PostThe Locksmith by Susan Kaye Quinn. Elena – I stumbled onto your blog post from a Twitter feed. Congrats on your 100th post. I just recently started taking blogging seriously and have a long way to go to catch up to you. In my opinion, writing and publishing novels is way easier than blogging! I wish you well on your novel. I would say it’s more difficult than writing a novel. It’s just different. When I sit down to write a story, I know I’m in for the long run, so I don’t worry so much about my word choice or sentence structure in the first draft. I know I can always change it during editing. But with a blog post, I need to structure my thought and put it out there in a clear and concise manner at the first try (I know some people write and rewrite their blog posts, but I don’t). I also try to stick to my schedule no matter what, so it thought me to be able to come up with topics and turn them into interesting posts almost on the go. It also helped me learn how to ignore distractions – children yelling, dogs barking, house falling apart around me, and I don’t notice because when I’m writing, I’m in the zone. So good luck on your blogging journey and hopefully soon you will get your 100th post as well! Just remember to take it as something fun you enjoy doing, not a job you HAVE to do.